If you’re not already fully consumed by March Madness, you’re about to have a reason to be -- even if you’re not a basketball fan. Days after announcing the official return of the P’Zone, Pizza Hut wants to give free pepperoni P’Zones to everyone. There’s just one catch, however. The giveaway is dependent on an unlikely outcome in the final games of the NCAA Tournament. If any one team -- Texas Tech, Virginia, Auburn, or Michigan State -- overcomes a 17-point or higher deficit to win in the Final Four round, Pizza Hut will give away free pepperoni P’Zones to people all across America, according to a spokesperson for the pizza purveyor. The chain even introduced a ludicrously cheesy new slogan in honor of the promotion, which is, “If 17 points are blown -- YOU get a P’ZONE!” Catchy, right? Another slight caveat is that you have to be a Hut Rewards member to be eligible for the freebie, but that’s there’s still time to sign up and it’s super easy. You just have to opt in before the first Final Four game on Saturday, April 6. Auburn will play Virginia at 6pm and Texas Tech will face off with Michigan State at 8:30pm. The championship game will be played the following Monday night. 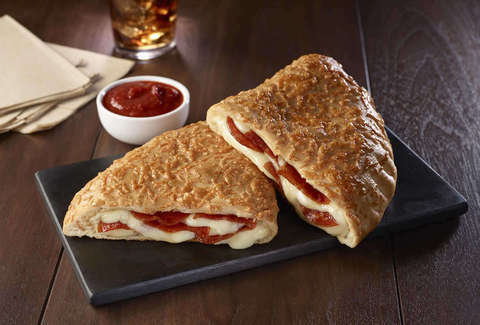 Even if your bracket is totally blown, free calzones would be a major win. Hell, you don’t even have to know what a bracket is to get excited about free food. If this unlikely comeback occurs, you’ll have to wait a little while to get your free P’Zone. If you’ve activated the promotion through your Hut Rewards, you can cash in on your winnings on April 17 online only. In the meantime, you’ll just have to pay for P’Zones, which just returned to Pizza Hut after eight years. In case you’re wondering, P’Zones are just Pizza Hut’s take on calzones. They feature classic Pizza Hut crust stuffed with melted cheese and toppings. P’Zones come in three different varieties: Pepperoni, Meaty, and Supremo. Each comes with marinara sauce for dipping, because there’s nothing worse than a dry P’Zone. Pizza Hut’s latest promotion only applies t o Pepperoni P’Zones, so if that’s not to your liking you’re out of luck as far as freebies go. Those hoping to get a free P’Zone from Pizza Hut will have to keep an eye on the scores of the two games being played on April 6. It’s pretty uncommon, but not impossible, for a team to come back from a 17-point or more deficit. Now’s as good a time as any to get your head in the game -- free food is on the line, after all.